The narcissist regards every criticism and disagreement as a threat to the precarious balance between his inflated, grandiose False Self and the demands imposed by reality. Narcissistic injury (or wound) is any threat (real or imagined) to the narcissist's grandiose and fantastic self-perception (False Self) as perfect, omnipotent, omniscient, and entitled to special treatment and recognition, regardless of his actual accomplishments (or lack thereof). The narcissist's thinking is magical. In his own mind, the narcissist is brilliant, perfect, omnipotent, omniscient, and unique. Compliments and observations that accord with this inflated self-image ("The False Self") are taken for granted and as a matter of course. Having anticipated the praise as fully justified and in accordance with (his) "reality", the narcissist feels that his traits, behavior, and "accomplishments" have engendered and generated the accolades and made the kudos happen. He "annexes" positive input and feels, irrationally, that its source is internal, not external; that it is emanating from inside himself, not from outside, independent sources. He, therefore, takes positive narcissistic supply lightly. The narcissist treats disharmonious input - criticism, or disagreement, or data that negate his self-perception - completely differently. He accords a far greater weight to these types of countervailing, challenging, and destabilizing information because they are felt by him to be "more real" and coming verily from the outside. Obviously, the narcissist cannot cast himself as the cause and source of opprobrium, castigation, and mockery. This sourcing and weighing asymmetry is the reason for the narcissist's disproportionate reactions to perceived insults. He simply takes them as more "real" and more "serious". The narcissist is constantly on the lookout for slights. He is hypervigilant. He perceives every disagreement as criticism and every critical remark as complete and humiliating rejection: nothing short of a threat. Gradually, his mind turns into a chaotic battlefield of paranoia and ideas of reference. When unable to re-enact the conflict with another. The narcissist relates to his human environment through his unresolved conflicts. It is the energy of the tension thus created that sustains him. The narcissist is a person driven by parlously imminent eruptions, by the unsettling prospect of losing his precarious balance. Being a narcissist is a tightrope act. The narcissist must remain alert and on-edge. Only in a constant state of active conflict does he attain the requisite levels of mental arousal. This periodical interaction with the objects of his conflicts sustains the inner turmoil, keeps the narcissist on his toes, infuses him with the intoxicating sensation that he is alive. The narcissist perceives every disagreement – let alone criticism – as nothing short of a threat. He reacts defensively. He becomes conspicuously indignant, aggressive and cold. He detaches emotionally for fear of yet another (narcissistic) injury. He devalues the person who made the disparaging remark, the critical comment, the unflattering observation, the innocuous joke at the narcissist's expense. By holding the critic in contempt, by diminishing the stature of the discordant conversant – the narcissist minimises the impact of the disagreement or criticism on himself. This is a defence mechanism known as cognitive dissonance. Like a trapped animal, the narcissist is forever on the lookout: was this comment meant to demean him? Was this utterance a deliberate attack? Gradually, his mind turns into a chaotic battlefield of paranoia and ideas of reference until he loses touch with reality and retreats to his own world of fantasised and unchallenged grandiosity. When the disagreement or criticism or disapproval or approbation are public, though, the narcissist tends to regard them as Narcissistic Supply! Only when they are expressed in private – does the narcissist rage against them. The cerebral narcissist is as competitive and intolerant of criticism or disagreement as his somatic counterpart. The subjugation and subordination of others demand the establishment of his undisputed intellectual superiority or professional authority. It is a "hidden or tacit competition" (Lowen). The cerebral narcissist aspires to perfection. Thus, even the slightest and most inconsequential challenge to his authority is inflated by him. Hence, the disproportionateness of his reactions. When confronting adversity fails, some narcissists resort to denial, which they apply to their "extensions" (family, business, workplace, friends) as well. Take, for example, the narcissist’s family. Narcissists often instruct, order, or threaten their children into hiding the truth of abuse, malfunction, maladaptation, fear, pervasive sadness, violence, mutual hatred and mutual repulsion which are the hallmarks of the narcissistic family. "Not to wash the family's dirty linen in public" is a common exhortation. The whole family conforms to the fantastic, grandiose, perfect and superior narrative invented by the narcissist. The family becomes a cultish extension of the False Self. This is an important function of these Sources of Secondary Narcissistic Supply. Criticising, disagreeing, or exposing these fiction and lies, penetrating the family's facade, are considered to be mortal sins. The sinner is immediately subjected to severe and constant emotional harassment, guilt and blame, and to abuse, including physical abuse. This state of things is especially typical of families with sexual abuse. Behaviour modification techniques are liberally used by the narcissist to ensure that the skeletons do stay in the family cupboards. An unexpected by-product of this atmosphere of concealment and falsity is mutiny. The narcissist's spouse or his adolescent children are likely to exploit the narcissist's vulnerabilities - his proneness to secrecy, self-delusion, and aversion to the truth - to rebel against him. The first thing to crumble in the narcissist's family is this shared psychosis - the mass denial and the secretiveness so diligently cultivated by him. Narcissists can be imperturbable, resilient to stress, and sangfroid. Narcissistic rage is not a reaction to stress - it is a reaction to a perceived slight, insult, criticism, or disagreement. Narcissistic rage is a reaction to narcissistic injury. II. Pernicious or Passive-Aggressive (P/A) - the narcissist sulks, gives the silent treatment, and is plotting how to punish the transgressor and put her in her proper place. These narcissists are vindictive and often become stalkers. They harass and haunt the objects of their frustration. They sabotage and damage the work and possessions of people whom they regard to be the sources of their mounting frustration. An occasional or circumstantial threat (real or imagined) to the narcissist's grandiose and fantastic self-perception (False Self) as perfect, omnipotent, omniscient, and entitled to special treatment and recognition, regardless of his actual accomplishments (or lack thereof). A repeated or recurrent identical or similar threat (real or imagined) to the narcissist's grandiose and fantastic self-perception (False Self) as perfect, omnipotent, omniscient, and entitled to special treatment and recognition, regardless of his actual accomplishments (or lack thereof). 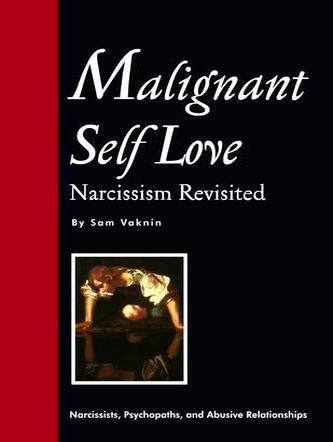 A repeated or recurrent psychological defence against a narcissistic wound. Such a narcissistic defence is intended to sustain and preserve the narcissist's grandiose and fantastic self-perception (False Self) as perfect, omnipotent, omniscient, and entitled to special treatment and recognition, regardless of his actual accomplishments (or lack thereof).